Smartwatches might seem like a recent fad, but countless companies have been trying to improve your wearable electronics for well over a decade. 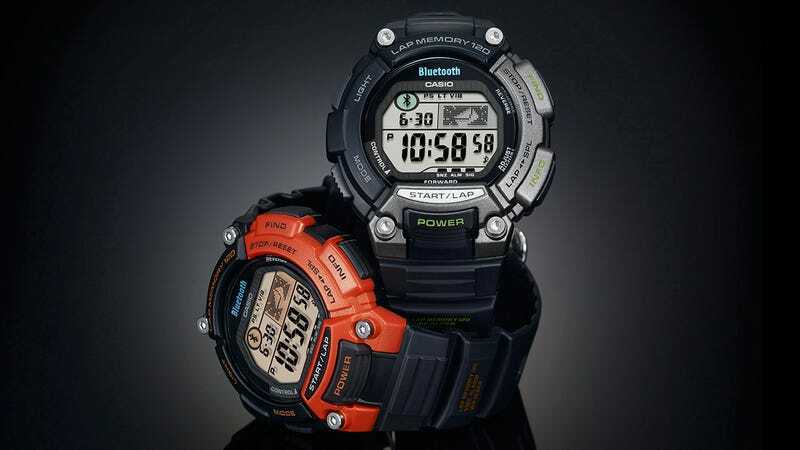 Including Casio, who were one of the first to integrate a Bluetooth connection into its watches letting it mirror notifications from your smartphone. And the company's latest model, the STB-1000, is even designed to double as a fitness tracker, piggybacking on your smartphone's existing motion sensors. Like Casio's previous Bluetooth watches, the STB-1000 takes advantage of the BT low energy profile so that it can stay in constant contact with your phone without prematurely nuking its battery. In addition to putting notifications for text messages, emails, and phone calls on your wrist—as well as serving as a wireless remote for your phone's music player—the STB-1000 introduces new connectivity for four popular iPhone fitness tracking apps. At launch, the watch will support Abvio's Runmeter, Walkmeter, and Cyclemeter apps, as well as Wahoo Fitness giving wearers easy access to metrics like distance, elapsed time, and even cycling speed.